Woo Hoo--thanks!!! This is becoming quite lucrative! Regarding order of operations, I also agree that you should stick with the scientific community's standard. Maybe you can just briefly reference this in the Quick Start Sample thingy in Opal Calc. You can ask people to "Please excuse my dear aunt sally." The reason 7-zip was putting everything in one folder was Path mode was set to "No pathnames". Changed it back to "Full pathnames" and it is now extracting fine also. I must have somehow changed it without realizing. But hey, I learned something. I'm using XYplorer for my file manager. Instead of taking a full screen shot I just used the capture region with Screenshot Captor. Heads up people! There's a new version out! 1.57! considered more newsworthy for your attention. $, € and @ on certain keyboards work again over v1.55/1.56. Thanks to aberg from Neowin.net for pointing this out! 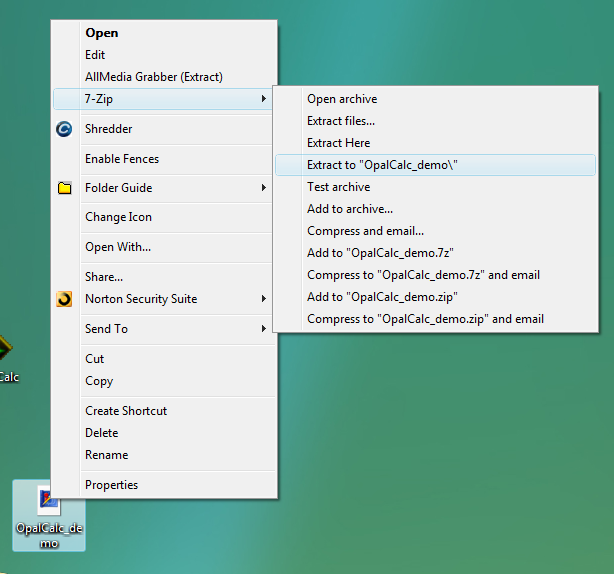 Since version 1.43, an annoying clock symbol is shown in some parts of the GUI during startup of OpalCalc. This is now fixed for 1.56 giving a smoother experience. You can now convert from seconds, or minutes/hours to the new special 'time' unit, overriding the "Default time unit" given in the "Options" window. An example is best apt to describe this one: 100 minutes as time (= 01:40:00). Or try: 1hour + 2minutes + 3seconds as time (= 01:02:03). 2012 Xmas edition: A long awaited update with tons of GUI tweaks and enhancements along with plenty of minor bug fixes. Thank you to everyone who's sent in feature/bug reports - we managed to give away around $50 to $100 in rewards. Not as much as I was 'hoping' for to be honest, but on the other hand, maybe it shows how far OpalCalc has come as not much needed fixing. We'll probably do something like it again soon - in the meantime, please send in any further bug reports, and we might pay you anyway. There were multiple occasions when a selection of text required a second click, causing frustration (at least subconciously). For example, copy, undo, redo, zoom in/out, copy/clear line, would 'disable' text selection, until you mouse-clicked again. Not any more. Spacing between operators has been overhauled. Firstly, spaces can be inserted between operators even if modulus or programmer syntax is enabled. Secondly, spaces can now also optionally be inserted between × and ÷ operators (as well as the old - and +). Thirdly, sums such as "4 + -3" or "test:-5" or "-5 '(beginning of line)" or "pow(3,-2)" won't now insert the unnecessary space before or after the '-' symbol. Fourthly, if quotes are used to comment the beginning or end of the line (; or : or '), then the minus and plus symbols won't now be used in those contexts. Functions using the parameter as the exponent now use proper operator precedence. An example would be: "f(n) = 3^n + 1". Calling f(2) now returns 10 instead of the faulty 27. Related errors were fixed too. F12 now removes the line altogether, rather than just clearing the line. I've found it surprisingly handy. If you want to just clear the line like before, Ctrl+X (without anything selected) will pretty much do the same. Live help has been improved. Most operators are supported (apart from + - / * ( ) to avoid info overload). It now also displays the unit assigned to a variable if there is one, and the unit type next to the unit (e.g. : "hour (time)" or "centimeter (length)"). A new more professional installer! It's quicker, smarter and the size reduced from 650k to 500k too. For scientific notation, you can now use small 'e' as well as capital 'E'. Example: 4e3 = 4000. Hovering over the answer will show the answer in a tooltip (handy if the answer would otherwise go past the right edge of the window. Overhaul for the "Show all Q+A" window. The menu item: "Show all Q+A" is now called "Export worksheet...". In that window, you can now save/copy worksheets with a tab (and the new 'spaces' gap) separating the sums and answers. (The 'spaces' gap is useful in a reader with fixed-width fonts). Font colours have also been fixed if you try adjusting gap spacing or the gap format, where the colour scheme was something other than "Snow". Also fixed text colouring for new lines using the "Equals" gap format. Better unit handling and unit error detection. Firstly you can now have compound unit types AFTER the 'as' or 'in' keyword (e.g. : "5metres/second as miles/hour"). In regards to error handling, things are a lot 'safer'. For example, saying "10cm^2 + 5cm" or "3miles/hour as hour" will report a 'mixed types' warning next to the answer. Also, sums with the "as" or "in" specifier will now warn you if there are mismatched units. For example, "1000 cm + 1ft as watt" or "1000 cm + 1watt as cm" will add a warning. When active, currencies update daily now without throwing an unnecessary message box to alert the user. The number pad's dot or comma should act as a decimal separator now regardless of country or keyboard type. Functions can now use 'shorthand' notation by allowing (for example) variables next to numbers (i.e. 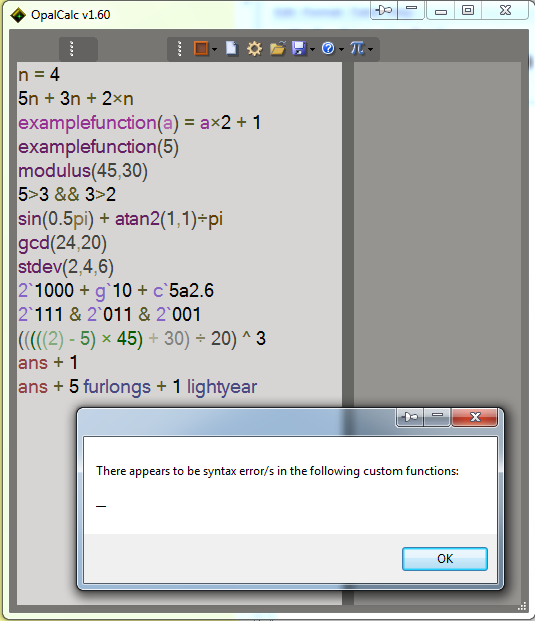 "myfunc(n) = 5n"). Make sure "Load last session at startup" is enabled. Then load Help>>Example Sums>>Complex Sums. Then close and restart OC. Nice find and thanks! I'll fix that for the next version. Doesn't happen with your own custom functions interestingly. now that v1.75 is out, how do i update my v1.61? the main link on the website leads to a 'lite' version and while the portable link downloads a demo version. Simple click the main brown/red square dropdown, and then "check for update". That should send you to the full version page. thanks for the reminder! i had forgotten that i was using the minimalistic look sans main toolbar therefore couldn't find the 'update' button. Oh I see! I should probably try the minimalist mode myself. @Twinbee: there seems to be a bug in the currency conversion as can be seen in fig.1 and my settings are per fig.2. Yes, the "USD" bit should always go after the number. The exception is the $ symbol which can before or after. thanks Twinbee, that did the trick! Hmmm.. is putting USD before the number very common in the US or other countries? It's not uncommon in Canada. Currency symbols are a nightmare across different publications/industries. Standards are all over the place. Here are some common ways that you will see in different places. I'll stick to USD for the examples. My preference there is (usually) for the top 2, though I prefer the bottom 2 for less formal usage. The top 2 are generally nicer to use with decimal places. e.g. USD $123.45. The 3-character ISO scheme is the easiest to use. 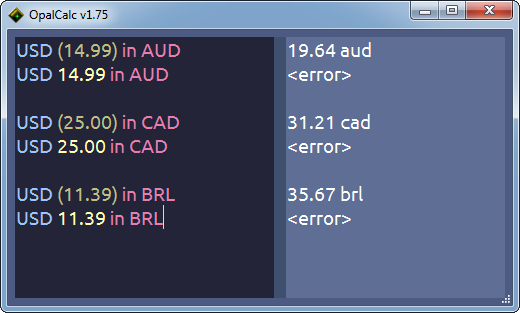 Using the actual symbols is a good idea as well when writing, though in OpalCalc I'd imagine that it wouldn't be needed as typing currency symbols can be difficult. ''There are various common abbreviations to distinguish the Canadian dollar from others: while the ISO currency code CAD (a three-character code without monetary symbols) is common, no single system is universally accepted. And that's the real problem. Local standards aren't very useful for non-locals. This makes the ISO system easier to use for broad/international audiences. Taking a page out of the cryptocurrency ecosystem, they use schemes that mirror the ISO standard (for the most part), e.g. BTC vs. DOGE, which is an exception with 4 characters. Wow talk about standardization. Just one more reason why I'd love to see a universal currency - then we could stick with '$' for everything! I think for now I might just cater for XYZ 100 (so I'd be supporting four methods of writing it in total). Just one more reason why I'd love to see a universal currency - then we could stick with '$' for everything! I loathe DST... and I've done programming for time... so I understand that video far too well... But is is certainly funny! Page created in 0.03 seconds with 59 queries.